They're pretty much everywhere outdoors during the warm months -- orange sulphurs are one of the most common butterflies in North America. Colias eurytheme follows a typical life cycle pattern for butterflies, except for the efforts taken to avoid hybridization by crossing with the closely related yellow sulphur butterfly. 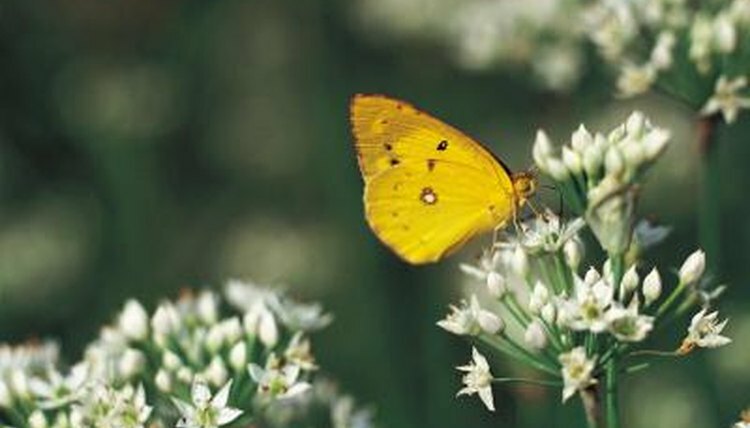 An orange sulphur butterfly can mate and lay eggs several times during a summer breeding season. The male is responsible for initiating mating among Colias eurytheme. To do so, he emits pheremones to alert females to his presence. The orange sulphur butterfly stands out to biologists researching butterfly mating patterns because the pheremone amounts and composition vary greatly among individual males. The amount of pheremone emitted directly affects how likely a female is to choose a particular male as her mate. The female orange sulphur also looks for ultraviolet reflection on male wings, which differentiates her own species from the very closely related yellow sulphur butterfly (Colias philodice). The male searches for markings on the underside of the female's hindwing to differentiate her from males. Once a female accepts a male as her partner, they copulate. Afterwards, the pair separates and the female seeks out a host plant on which to lay her eggs. Hosts are generally the same plants from which the adults eat nectar, such as alfalfa and clover. Once she finds suitable vegetation for her eggs, the female deposits them on the tops of the leaves. She lays several hundred eggs at a time. The eggs start out tiny and white, but turn red after several days of development. The eggs hatch into caterpillars, which immediately begin feeding on the host plants. As youngsters, orange sulphur caterpillars eat from leaf stem to tip, and as they age they eat one half of the leaf, then the second, as divided by the central vein. They feed mostly at night. Their favorite foods include legumes, members of the pea family (Fabaceae), clover (Trifolium) and alfalfa (Medicago sativa). Because this species is so successful, the caterpillars can sometimes become pests on commerical crops. The caterpillars are green with yellow and red markings. The caterpillar's purpose is to feed, grow and ready itself for the chrysalis stage. Once the caterpillar has fattened up, it can find a suitable place to build its chrysalis and metamorphosize. Colias eurytheme pupae are light green with a yellow stripe and brown markings. Pupae that form late in the season will overwinter. The number of butterflies that emerge from the overwintered chrysalises varies depending on how harsh the winter was. Only days after emerging from the chrysalis as an adult, Colias eurytheme can mate and begin the cycle again. The average lifespan for an adult orange sulphur is two to four weeks, but if an adult manages to hibernate during winter it can survive up to a year. PMC: Disruptive Sexual Selection in Colias eurytheme Butterflies; Sappington, Thomas W.; Taylor, Orley R.